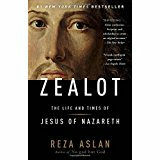 This is an engagingly written new book by Reza Aslan bout Jesus of Nazareth (the historical Jesus, as opposed to Jesus the Christ). In it, he tries to makes sense of several incongruities in Jesus’s 1st-century Palestine. I am always amazed at how narratives change! For example, in Christianity’s narrative of the crucifixion, do you ever wonder why Pilate is painted as trying to prevent it, offering the other criminal instead, while the Gospel writers have the Jews shouting about Jesus “Crucify him! Crucify him!” (and starting the horrid anti-Semitism ball rolling early on)? This is the same Pilate, after all, who was renowned for hating the Jews, for total disregard for Jewish rituals and customs, for signing so many crucifixion orders that a formal complaint was reportedly filed against him in Rome. Not to mention that there is no convincing evidence that a Passover custom of choosing a criminal to free ever existed. And since Christmas is approaching, consider also the birth narrative: Why does Luke have it in Bethlehem when everything points to a birth in Nazareth?